What if I told you autonomous vehicles will be the new taxis starting in the early 2020s. Would you believe me? Ford aims for a future with an autonomous ride-hailing fleet of vehicles by 2021. 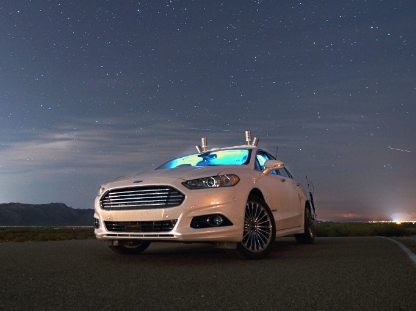 Ford is working closely with multiple tech companies – one that manufacturers LIDAR sensors, another that engineers “machine learning” software, as well as one that works in 3D-mapping. They have most of the bases covered, as well as an autonomous car that can already drive itself in snowy conditions. There is yet to be an actual vehicle produced, as currently Ford mainly has a team of engineers working on the software. Their goal is to have a SAE Level 4 automation clearance – humans will only be able to take partial control of the vehicle. Kind of scary when you think about it, right? Especially when the vehicle may not even come with a steering wheel or pedals. At least throw in a fail-safe. So what’s the big deal? More autonomous vehicles hitting the market? Not at all. This vehicle will solely be for ride-sharing similar to Uber or Lyft. Consumers will not be able to purchase these. Within the coding of the cars there will be restricted zones where the car will be able to drive. Let’s say someone wants the car to take them to an airport – it will only take one or two routes, other than driving around multiple streets looking for alternate routes. I don’t have a problem with this as it keeps the vehicles in check and safer for pedestrians. For example if a pedestrian is terrified of autonomous vehicles they can just avoid said road. This all may seem new to many people, but Google and Uber have been going against each other for some time with self-driving taxis. Ford is just now joining the race. But it’s a big deal because it’s the first actual car manufacturer to do so. That’s what’s great about Ford – they aren’t only focused on building standard vehicles, instead expanding their technology and future focus. All-in- all this is a great idea – companies focusing on autonomous vehicles driving consumers to their destinations. A lot of people can be terrified of a random individual driving them around. My only qualm with this is that there may be no steering wheel or pedals. I’m sure there will be some kind of fail-safe where the passenger can take over if anything serious occurs – i.e. a natural disaster or something of the sort. Let’s just hope this tech works for the good of humankind. If these autonomous vehicles develop a mind of their own, we may be in big trouble.